I had a post all prepared, I finished writing it yesterday morning, and planned to give it one more proof read that evening before posting it, but apparently Blogger caught the flu or something, and what I had finished in the draft area has evaporated back to my rough outline and beginning notes. I will take me a few days to stop complaining and sit down to rewrite where I was going with it. At any rate I am in for a pretty big weekend and that will slow me down as well. The Viking Age Reenactment Group I am a member of Tribe Woden Thor will have a set up and display Saturday and Sunday at the Westby Wisconsin "Syttende Mai" celebration. (Syttende Mai = 17th of May = Norwegian Independence Day). We will have our museum tent set up with reproductions of Viking Age arms and armor, one of our guys sits and weaves Chain Maille while visiting with the public. Others sit and talk about the weapons specifically. I usually visit with people about daily life in that age including past times like games the viking's played and I show them reproduction coins and trinkets of daily living. But this show will be different for me. 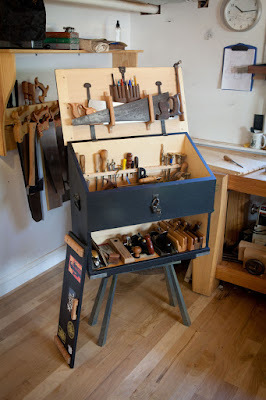 I have finally decided to set up my traveling joinery workbench and do some woodworking. 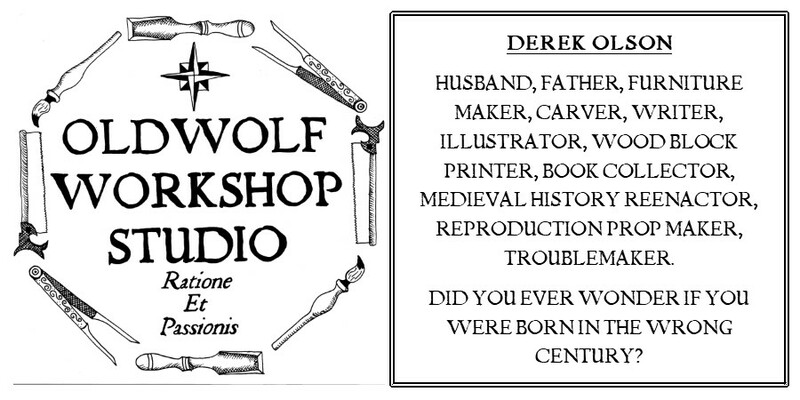 I will not be cutting joinery and constructing casework or anything like that, my tool kit is still not set up for that type of demo, (some of the stuff I have just looks too damn modern, even to a layperson's eyes) Instead I am going to set up and demo medieval carving. What does medieval carving look like? Well if you have ever been over to Peter Follansbee's Blog and seen his work, then you have a pretty good idea. Peter focuses on the 17th century with his work but in truth there was not a very significant advance in furniture or decoration of furniture from 1000 AD up to the middle to late 1600's. Infact 17th century furniture designs and techniques were all heavily influenced from the earlier medieval time period. Yes things became somewhat more refined, but as I look at Follansbee's recreations I can clearly see the influences of earlier time periods I've studied. So I decided to construct a carved box, I picked up some red oak this morning and spent the day prepping the sides and lid of the box, all of which I will carve. I cut dovetails for all the corners and packed my tools for tomorrow. Wait...did I say I dovetailed the corners? But Mr. Follansbee either nails or drawbore pins the corner's of his carved boxes. Am I sure I know what I'm talking about? Well I chose dovetails and I think that there is some period accuracy to my decision. You see the reenactment troupe I am part of considers itself as hailing from the Northern reaches of Germany between 800 and 1200 AD. Some of us portray the Viking influences in that area, and some research the Tribal Germanic peoples. As a character, I play Beorn The Oldwolf, a Viking who has chosen to settle in Northern Germany due to upheaval and turmoil in his home Trondheim Norway. This was very common for the Norse, we would just move in, claim a chunk of land as ours, (try and take it back...) and start a new life. Therefore as a joyner of wood Beorn would have become influenced by German styles and craftsman. There are very few remaining pieces of furniture from the era that I can point to to prove my point but I make a little conjecture based on what I know about German settlers to America, and the fact that they used joinery dovetails and sliding dovetails extensively in their work because of the strength. Where the English influenced woodworkers of the time, did a lot of their work with pegged mortise and tenon joints. read a little about furniture history and you will get the story of the change from Jacobean furniture styles into the more ornate William and Mary style. Historians claim the change came from the influx of Danish artisans. I may be drawing inferences on some weak evidence, but the dovetail joint has survived through the centuries all the way from ancient Egypt and it had to survive somewhere. With their stereotypical reputation for quality engineering and superior construction of goods, and I call that just enough evidence to join this box with dovetail. But I did it mostly because I like dovetails. But all the set up and preparation today got me thinking about a couple weeks ago when my 11 year old daughter Fayth followed me out to the shop. She shot the BB gun for a few hours and when she got tired of that she uttered those famous 11 year old words, "Dad...I'm bored"
I thought about it for a few minutes and came up with what I thought was a brilliant idea. I had my laptop and my copy of Peter Follansbee's 17th Century carving video, (I wrote up a review on that one you can find HERE) I had her sit down and watch the first half of it or so. Then I planed up a crappy pine 2x6 for her and set her to work carving. I helped her with some of the layout and got her started on technique, but mostly I just let her go for it and work away, It was beautiful, a couple hours of her quiet concentration and the rhythmic rap of the mallet. She was smiling and I got some more work done. So I wish you all a good and fulfilling weekend as I plan to have one of those myself, and you will hopefully hear more from me on Monday.